The popular East Village spot will open a new outpost among the rising towers on the far West Side. Residents of the far West Side will soon have a new breakfast option. The owners of the East Village’s B Cup Cafe will be opening a location at 500B W. 42nd St., between 10th and 11th avenues. 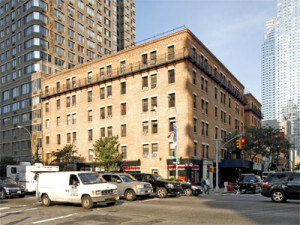 The tenant has inked a 10-year lease for the 800 square-foot ground-floor space, where the asking rent was $120 a square foot. The café will open its doors at a time when the neighborhood boasts a number of major construction projects led by the Hudson Yards mega-development. The prospect of a major step up in the number of people living and working in the area has had a big impact on retail rents in the once-quiet neighborhood. “[Rents] are steadily rising as the area continues to develop,” said Margaret Royer, the Square Foot Realty broker who represented the tenants. Building on the success of B Cup on East 13th Street, the owners set their sights on channeling the new energy of the West Side. “We see the far West Side of Manhattan as up-and-coming, backed by innumerable construction projects,” said Jordan Hadani, who co-owns the café with Guy Weizmann. The tenants expect they will serve residents of the new high-rise apartments in the area, as well as the large flow of tourists. Brokers Howard Aaron and Teodora Koleva, also of Square Foot Realty, represented landlord Clinton Housing Development Co.